Robert Murphy is an associate professor in psychiatry and behavioral sciences and co-founder and senior counsel with Family Connects International, part of the Center for Child and Family Policy. 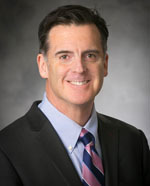 Murphy also serves as executive director for the Center for Child and Family Health, a partnership with the community and three universities (Duke University, The University of North Carolina at Chapel Hill, and North Carolina Central University) that is dedicated to research, training, and intervention for child trauma and maltreatment. Murphy is a licensed clinical psychologist whose work focuses on child traumatic stress — including its treatment and prevention — and on development and dissemination of evidence-based interventions. His interests include the treatment and prevention of child maltreatment and traumatic stress, dissemination of evidence-based interventions, implementation science to improve quality of care for children and families, and mental-health care for military families. In addition, Murphy serves in a leadership role for both Durham Connects and Family Connects International — local and national programs connecting families with newborns to community resources via nurse home visits.